The Olpererhütte of the DAV-section Neumarkt i. d. OPf. 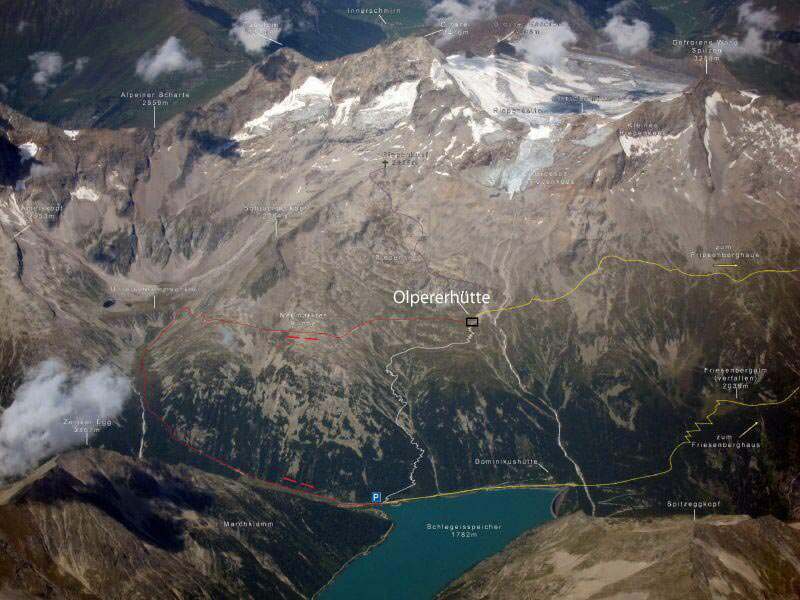 is located in the Zillertaler Alps on 2,389 m altitude in the mountain park Zillertaler Alps, above the Schlegeisspeicher (1,782 m). Due to the south-facing location in the Riepenkar, directly below the massive Olperer (3,476 m), the third highest peak in the Zillertalerl Alps , the visitors of the hut can enjoy the sun all day. From Olpererhütte you have a great view across the lake to the Zillertaler Alps and the glacier field of Schlegeiskees and the ice-capped peaks Hochfeiler (3,510 m), Großer Möseler (3,473 m), Hoher Weißzint (3,371m), Hochferner (3,473 m). 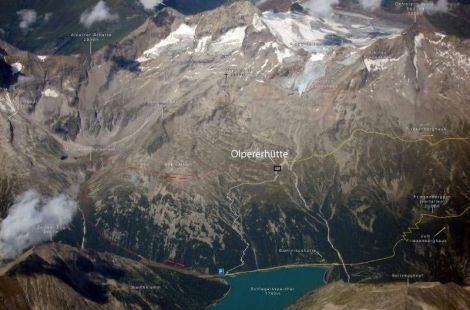 The Olpererhütte is located on the long distance trail 502 from Munich to Venice, on the Zillertaler Runde, on the Berliner Höhenweg and the Neumarkter Runde, newly created panoramic trail in 2006. For the exact date please ask the tenant. It depends on the seasonal snow conditions and opening times of the toll road to Schlegeisstraße. Outside this period the Olpererhütte is closed. The winter room is open with AV-keys during the off-season. 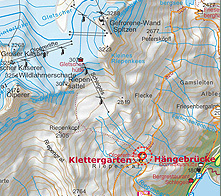 The nearest station is Mayrhofen that can be reached with the Zillertal Railway. From there continue by bus to Schlegeisspeicher. From the north via Kufstein, exit Wiesing / Zillertal, to Mayrhofen, turn left in direction to Ginzling, farther to Schlegeisspeicher. From Breitlahner a road charge will be demand for cars.